Yesterday evening I had the pleasure of attending the Garndiffaith Gleemen Male Voice Choir Annual Remembrance Concert at Garndiffaith Millennium Hall. This is the 69th year since the choir was formed and as always they didn’t disappoint with many favourites of mine, including ‘The Rhythm of Life’, ‘Take me Home’ and ‘What a Wonderful World’. 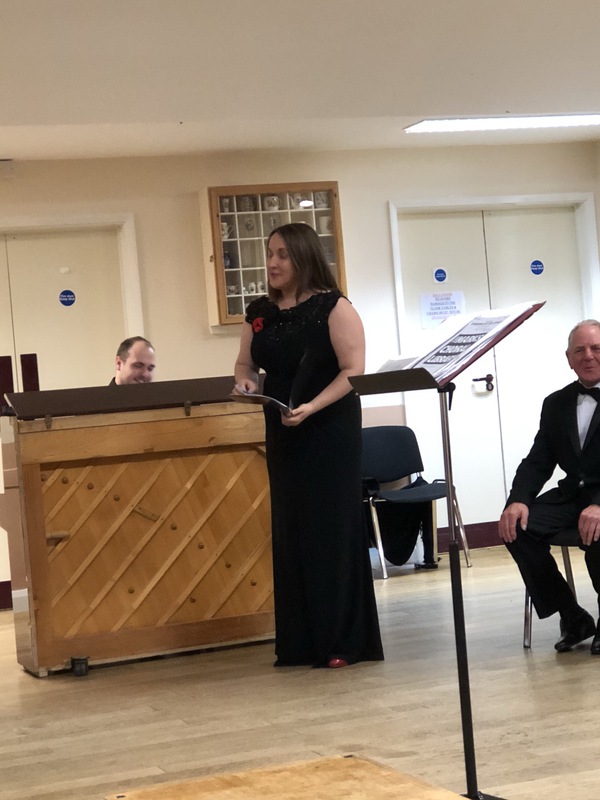 Under the watchful eyes of Musical Director, Mr John Jolley and Accompanist Mr Gareth Kibble the choir entertained the audience with what could be only called a treat for the ears. This years special guest artist was Soprano Claudia Wood, who is currently on the MMus Vocal Performance Course at the Royal Welsh College of Music and Drama and was her Piano Accompanist was multi prize winning musician and conductor, Conal Bembridge-Sayers. During the concert a Remembrance Day Tribute was given, Rev Bev. Morgan gave the Exhortation along with a minutes silence. Guests attending included the Lord Lieutenant of Gwent, Brigadier Robert Aitken CBE, the RT Hon. Lord Murphy of Torfaen, Gwent High Sheriff, Kevin Thomas of Monmouth, Mayor of Torfaen, Jess Powell and Consort, Leader of Torfaen Council, Anthony Hunt and many others. This was my first concert as a Vice President of the Choir and as always they did Garndiffaith proud! On Thursday, February 6, 1890, just before 9am an explosion, so violent it was heard for miles around, blasted through the workings deep underground. Bodies of men and horses were broken and crushed, leaving 176 men and boys dead. I would like to thank Abersychan ward resident, Mrs Hazel Jenkins for her recent coffee morning that she organised to raise funds towards the Llanerch Mine Disaster Memorial. Mrs Jenkins a well known and respected charity fund raiser in the Abersychan ward managed to raise around £300 towards the target for the memorial. As always Mrs Jenkins had a selection of delicious home made cakes along with a good selection of raffle prizes on offer. Her home was full of supporters and it was a pleasure to once more attend as ward Councillor to support her efforts along with listening to some attendee concerns on issues affecting the ward. Within the next few weeks I’ll be liaising with the Snatchwood Councillor with regards to organising the next memorial service at the Llanerch, as the site is now in Snatchwood Ward after recent boundary changes. Bonfire night was full of fun, food, fireworks and entertainment last week at Noddfa Church Hall. At least 50 members of the congregation turned up with their children at the unpublicised event to join in the fun, members brought food and all enjoyed Chilli, Hotdogs, Stew and many cakes made by church members. The games were great fun, including me being blindfolded and asked to remove marshmallows off a string using just my mouth. It was a good warm up before wrapping up warm to go outside to see the fireworks. As always the event was FREE and everyone was made to feel really welcome, no one were excluded, from the youngest to the oldest. As you are probably now aware, I took part in #silentspeaks to experience the frustration that Motor Neurone Disease sufferers experience and raise funds for MND. One of the first symptoms many sufferers experience is loss of voice as the muscles deteriorate, this leads to issues forming words then total voice loss. As the disease takes hold, the only area unaffected is the brain, making the sufferer aware of everything and everyone as their body fails. Watching my father suffer this way, I really can’t explain enough how cruel this terminal disease is, the final part usually consists of total respiratory failure as the disease stops the diaphragm working leading to suffocation, this all took place within 4 weeks of diagnosis in my fathers case. Having lost my father this way, it left me with two options, one was to grieve and be haunted by this for the rest of my life, the other was to stick to the promise I made to raise awareness and try and help others in this position receive the care and support they need. Just hours into my sponsored silience I felt helpless and emotional, experiencing what so many are going though when they lose their voice. Experiencing what my father did, made me understand how he felt and many others who suffer from MND. Although I didn’t raise a vast amount of money (£300), the experience is invaluable to help me understand and come to terms with this vast emptiness I have inside me at the moment. If I only raised enough to buy one voice aid, then at least Ive helped one person to communicate. In December I propose asking Council to adopt the Motor Neurone Charter to raise awareness and to help support people suffering from this rare condition. During 2018 I will be throwing myself into raising funds for MND, so be warned!! A warm welcome to the latest business to set up shop in the ever popular shopping hub within the Abersychan Ward of Torfaen. Hope’s Pantry specialises in producing a variety of different home-made fudge. Last night I was honoured to be asked to attend a special tasting event at the shop along with other local business owners and guests. Some of you will recognise Mrs Jess Hope from her tireless fund raising for her son Lincoln to have a life changing operation (Lincoln’s Legs). Originally from England, Jess started Hope’s Pantry from her home kitchen, before moving to Wales. Settling into the ward, Jess decided to share her fantastic culinary skills and take the plunge and open her own shop. The shop will also stock a range of flapjacks and these will be added to as demand rises. Abersychan Ward is rapidly being a hotspot for new business start ups and it already offers a wide range of services which makes me extremely proud to represent. During the past 5 years the ward has seen several new independent shops and businesses open, bucking the trend locally. I personally wish Jess the best and look forward to visiting regularly I’d also like to thank her for putting her confidence in the Abersychan Ward. Today is the 127th Anniversary of the Llanerch Mining disaster which took the lives of 176 men and boys from the local area. As we have done for the past 3 years, Gwyneira, Wayne and myself organised a walk to the site from the car park situated below. This year we were once again joined by Council Officer Fiona Ford who gave the children from Garnteg and Victoria Primary Schools a short history lesson based on the event all those years ago. This year we invited the Mayor of Torfaen to attend along with our MP, Chairman of Pontypool Community Council and the Leader of Torfaen County Borough Council along with members of the public. This I felt is deserving for the miners who lost their lives. Once again we were blessed with the weather and the mist climbing up the valley give the whole site an eerie feel which added to the experience. Pastor John Funnel led prayers which was then followed by the laying of daffodils around the fence protecting the filled shaft. I must also say thank you to the Millennium Hall Committee who made lunch boxes for the children attending and Gwyneira Clark for collecting the 25 bunches of Daffodils. Without the support of Gwyneira, Wayne and the Millennium Hall Committee, the organising of this annual event would be so much harder to achieve.